Vice Ganda has achieved a lot of success in 2018. His most recent one is his Metro Manila Film Festival entry Fantastica which is a certified box-office hit. But the It's Showtime host considers granting his mom Nanay Rosario's wish to visit Barcelona, Spain, as his biggest achievement in 2018. Vice Ganda and his mom ended their year in Barcelona, Spain, with some of their friends. 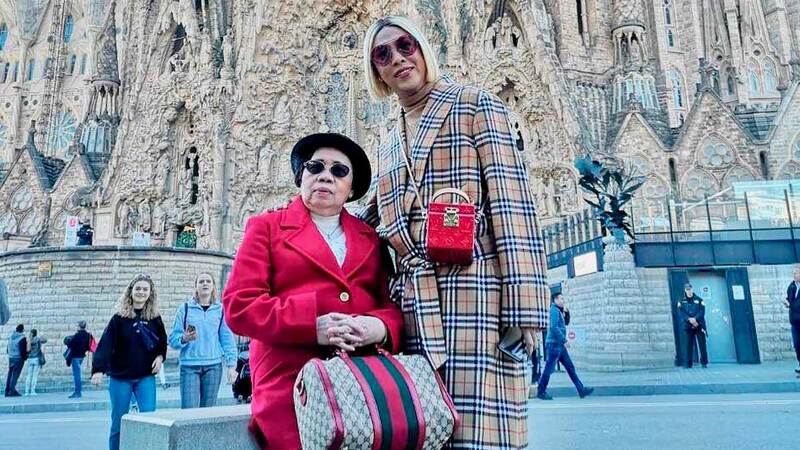 The Kapamilya comedian posted his photo with Nanay Rosario on Instagram on December 31 and said that it was his mom's biggest dream to visit the Basilica of the Sagrada Familia. He wrote in the caption, "Last year she said she wished to go to Barcelona to be able to see the Sagrada Familia. "My profession deprives me of quality time with my family. "So when given the chance I make sure every moment counts and everything creates a wonderful memory. "Before this year ends I brought her to where she wished to be." Vice Ganda and his mom, however, encountered a small problem. The Kapamilya host didn't know that the tickets to enter the Sagrada Familia were supposed to be booked online. Vice Ganda then reached out to some of his contacts and was able to secure one ticket for Nanay Rosario. He continued his caption, "I didn't know we had to book online to get access inside the church. So I asked a friend for help. "Unfortunately only one could get inside. And like a parent to a child, I am now patiently waiting for her to finish her 'field trip' inside the Sagrada Familia. "I AM THE HAPPIEST SON RIGHT NOW!!!! Fantastica is such a huge hit and continues to win in the box-office. "But for me, this is a bigger achievement. My biggest so far. "To be able to grant my Nanay's wishes as she gets older is big deal for me. "Vice Ganda is accomplished. Tutoy is successful. This is how I end my 2018." It seems Vice Ganda has made a tradition of ending the year with his mom, who lives in California. In 2017, the Viva talent flew to San Francisco where he surprised Nanay Rosario with a special family get-together on New Year's Eve.